DC Comics is releasing its solicitations for May on Monday at 5 p.m. (ET). Check bach here then for a complete rundown. 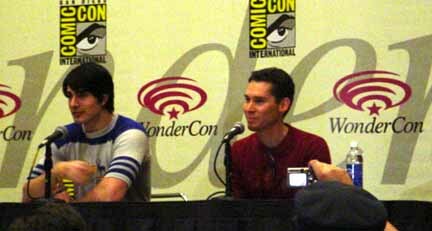 Brandon Routh, star of Superman Returns, joined director Bryan Singer for the Warner Bros. presentation at WonderCon on Saturday. For a rundown of the highlights from the panel, CLICK HERE. And on Monday, look for a transcription of the press conference with Routh and Singer that followed the panel. 20th Century Fox handed out some 500 X-Men: The Last Stand posters Saturday WonderCon. The posters were awarded through a ticket lottery at the Fox panel. 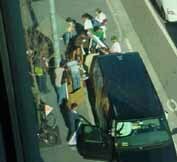 Winners picked up their prizes outside the Moscone Center from a van that displayed the posters. The posters -- featuring Hugh Jackman as Wolverine, Halle Berry as Storm, Famke Janssen as Phoenix, Anna Paquin as Rogue, Kelsey Grammer as Beast and Ben Foster as Angel -- will be appearing in public soon. "The posters were a big hit at WonderCon. The fans clapped enthusiastically when they were shown on the screen, paticularly for Beast and Angel," said associate producer David Gorder, who was at the convention on Saturday. "It was cool to hear that response from the X-Men fans. 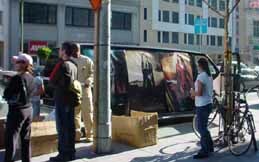 'Take a Stand' is is a unique outdoor campaign, an idea that is fresh and cool. It gets the initial theme of the movie out there too." Gorder said the production is headed back to Vancouver for additional shots. "Everything is coming along nicely," Gorder said. "Brett (Ratner, director) has done an awesome job. The movie is going to blow people away." 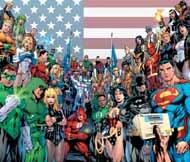 Grant Morrison is the new writer of Batman, it was announced Saturday at DC Comics' panel at WonderCon in San Francisco. Morrison will take over Batman following James Robinson's eight-issue run through Batman and Detective Comics. "I've already plotted 15 issues," said Morrison, who added that the first story is called "Batman and Son" and features Talia. For all the highlights from the panel and more than two dozen new images, CLICK HERE. Dark Horse Comics is celebrating its 20th anniversary in 2006 will special-edition works. At the publisher's panel at WonderCon on Saturday, Dark Horse's Lee Dawson said there are at least two projects in the works. One is a prestige format collection of Dark Horse stories and the other is a hardcover from diverse creators. For highlights from the panel CLICK HERE. * During his panel at WonderCon Saturday, Grant Morrison said he has finished his script for a film version of his We3 for New Line Cinema. * Peter David has signed an exclusive contract from Marvel. David is the writer of X-Factor and Friendly Neighborhood Spider-Man. He will continue writing Fallen Angel from IDW Publishing and Soulsearcher and Company from Claypool Comics. * Coming Monday: News from WonderCon -- and much more!!! * Tuesday, Feb. 7: Supergirl, The Batman, Dark Horse and DC First Looks and Moonstone Books for June.